Eggan died July 7, 2007. Ferd Eggan, longtime leader of the HIV/AIDS, queer and other social justice movements, died in Los Angeles on July 7 at age 60 after a six-month bout with liver cancer, complicated by HIV and hepatitis C infections. Eggan was an activist since his college days in the 1960s, initially in the southern black civil-rights movement and later in anti-war, anti-capitalist, anti-racist, women's and gay liberation and HIV/AIDS struggles. He was a co-founder of ACT UP/Chicago and the national ACT UP PISD Caucus ( People with Immune System Disorders ) , before moving to Los Angeles to become executive director of Being Alive: the People With HIV/AIDS Action Coalition of Los Angeles. 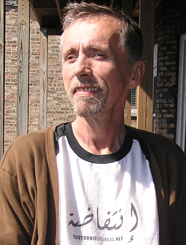 While serving as AIDS Coordinator for the City of Los Angeles between 1993 and 2001, Eggan opened doors for the funding of self-organized programs for women with AIDS, city authorization of and funding for needle exchanges, housing for PWAs who might still be active drug users and a landmark study and intervention program for gay men using crystal meth. He retired on disability in 2001 and concentrated on his writing, journalism and video art, some of which may be seen at ferdeggan.net. The Importance of Being Ferd is a tribute written before he died and Fags and Dykes Want Everything: Dreaming with the Gay Liberation Front is an article Eggan wrote in 2006.